Membership in the Association - Pointer-Freunde e.V. You want to become an official “Pointer Friend”? 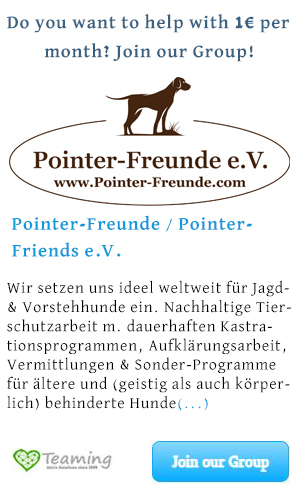 Become a member of our Association “Pointer-Freunde / Pointer-Friends e.V.”. Through your membership, you help us by being a reliable partner in our daily work. We are able to calculate and work with the membership and associate member fees. It is very important in our work that we do not have to “live and work from day to day” waiting for the next donation. Many regular expenses for dogs under our protection are inevitable and must be ensured. Be part of a wonderful community of people who strive for the lovable breed of the pointer. Only together we can succeed to publicize the hitherto almost unknown side of the pointer and help pointers in distress. Please read the Statutes of the Pointer-Freunde / Pointer-Friends e.V. before filling out the application form. After submitting, we will contact you to discuss the details. For membership as a foster home or as a volunteer give a short summary of yourself please.